If you play a sport you already know that you need the right footwear for the job. Don't wear your running shoes for anything but running - you don't want to destroy the special absorption soles any quicker than they do from normal use: six months if you run regularly; three months if you run a lot. If you do lots of cross training (like outdoor circuits or boot camp) in a single session get some cross training shoes. Serious cyclists use toe-clip shoes, less serious cyclists have cages on their pedals. If you've got cages on your pedals watch out that your shoe laces don't get caught in the cage - I've had both feet get caught which made for a very amusing horizontal dismount! I now cycle in my Baxter boots which also keep my toes nice and warm in cold or rainy weather. My fave training shoes are my converse hi-tops. The laces are flat so they don't get caught in my pedal cages, they've got grippy rubber soles good for weight training, they're flexible enough for stretching in and I can wear them as regular shoes too - and they weren't expensive like my runners! 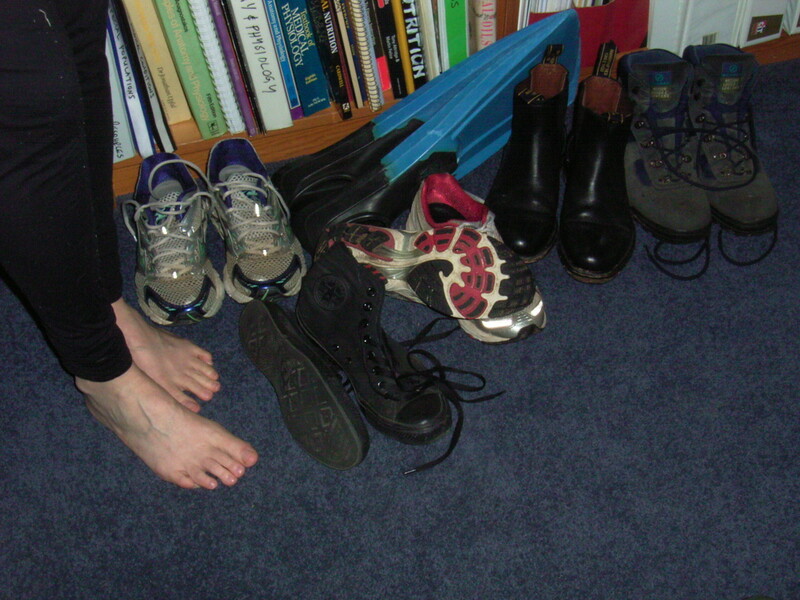 Photo (left to right): bare feet, old runners, high top sneakers, good runners, Baxter boots, hiking boots; and at the back fins for pool work. Yep, totally agree. 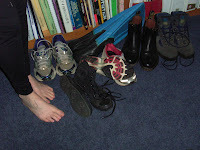 Need good footwear at all times except on the beach,in bed or in the shower perhaps. Love my runners and light hikers, oh and the thought of heavy hiking boots in the cupboard. Dress shoes? Nah, who needs them. It is a sensible idea but I tried it today and it meant changing my shoes more often than I was interested in. You go for a run/walk, you get back and then get a phone call that means you have to pick up someone so you head for the car without a chance to shower, but you have to bring the clothes in off the line before you go! The good shoes get left on-even if it is expensive.